(Newser) – If you've ever wanted to get a good look at an asteroid, Monday night will be your best chance for more than a decade. 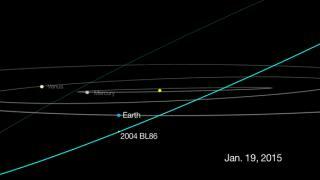 Asteroid 2004 BL86, a space rock about a third of a mile in diameter, will be 745,000 miles away on Monday, around three times as far away as the moon, reports CNN. Barring cosmic surprises, the next close encounter with something that big will be in 2027, and NASA says that while 2004 BL86 doesn't pose any threat, it gives astronomers a "unique opportunity to observe and learn more." Very little is known about this particular asteroid and it won't be this close again for 200 years. NASAL you incompetent booger! You said one that hit Chelyabinsk is gonna fly by!